Welcome to the February 2019 Issue of Betterbaking.com! I’m delighted to welcome you back to my kitchen where I’ve been in a babka dervish, testing and refining this wonderful pastry until it reached 'definitive' status. Just what is a babka, you may well ask? It’s a sweet, yeasted coffee cake in the East European Jewish tradition. Babka's usually come in chocolate or cinnamon flavor (a result of schmear or filling inside them) and while they’re easy enough to make, there’s a special mystique to making an exceptional one. For years I made a ‘bready’ babka, which was the classic and it was much like any good sweet-yeast coffee cake, moist and lofty and a cross between pastry and bread. As good as it was, I always wanted to improve my recipe or create a different version. When I tasted a chewy, sticky-style babka at a local baker that specialized in them, I was lit up! I became a baking blood-hound, determined to get to the bottom of this amazing sweet. Yet until about a week ago, despite many efforts, I was still unable to figure out how achieve that many-layered babka that was both sticky and chewy (and decadent!) versus bready. I tried a few approaches. First, I upped the filling but no-go. No matter how much I piled on, the filling disappeared in the baking and the layers were barely apparent. Then I reduced the yeast (to make it less bready) and that was good or better but still not the ticket. Then I had a revelation: what if the secret to sticky, chewy babka was simply piling on so much rolled dough so that it was weighty enough to compress itself. This should effectively stop the babka from rising and result in all those interesting layers and that sticky, chewy texture. Turns out I was right! It worked. Then I worked backwards on the recipe, creating the best, most buttery dough, with the perfect amount of sugar, salt and butter (my babka tastes like brioche!). Last I considered the trending flavor of the moment. Was it cinnamon, Nutella, or chocolate? Well, that was quickly solved when I visited a falafel place where they featured a stunning halvah babka. I had to make that! That decision left me with the task of perfecting the halvah filling. And then just to make sure this is a stupendous recipe, I also brought in a couple of BB test bakers to make sure the recipes works and is, as promised, sticky and chewy and delicious. More good news: you can also use the recipe and my method to make a classic chocolate or cinnamon babka if you prefer. (One small point: anything sticky chewy can be problematic in confirming when it’s done baking and also, when just baked, it can taste under-baked or a bit ‘wet’. I assure you if you give this babka time to rest it will morph into sticky, chewy, and definitely not raw, babka). On another note, I've been experimenting with a small baking video on one of my most iconic recipes BB Pizza Croissants featured as this month's free recipe. This one-minute video will show you how to make this baking snack a snap. This recipe is a beloved family favorite that I think you'll adopt too. Like calzone, (Super Bowl perfect snack-food) Pizza Croissants keep for a few days or freeze and are great with salad as a meal or take-along lunch. 20% off BB Readers with Soho Leather Journals! And if you want to explore your love of writing this February, I’m chuffed to pass on a great discount on a beautiful leather journal from our friends at Soho Spark Journal. They offer a few designs in their leather journal (I chose the Peace Dove) which features lined paper that befits any sort of pen: fountain pens (don’t bleed), rollerball or ballpoint. For the month of February, use this code: "bettertogether219’ or this link https://sohospark.com/discount/bettertogether219 to get your 20% discount. Please also take a look at artist Lori Robert's gorgeous gratitude journals, filled with beautiful art and gratitude writing prompts at www.LittleTruthsStudio.com. 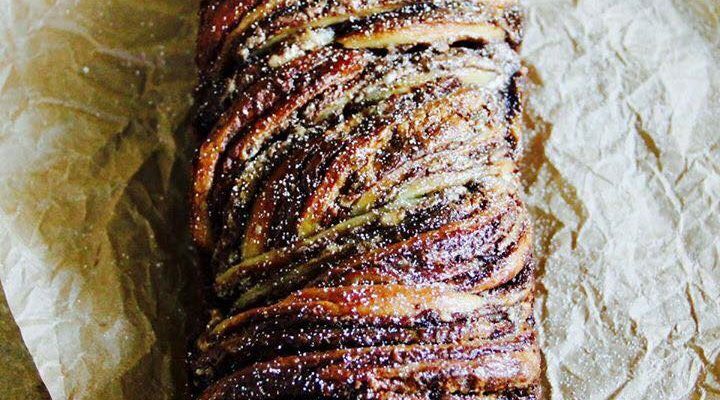 This fabulous Sticky Chewy Babka would give the best baker in New York City a run for their money. This recipe also works with cinnamon or chocolate schmear filling. I love mash-ups especially when they combine two iconic types of baking such as Red Velvet Cake and a creamy cheesecake! It's hard to beat the heart-warming appeal of something that is healthful and tastes great. These Carrot Cake muffins are filled with good things that are also uncompromisingly delicious!